The Pagoda in Albion was built in 1914 as a community project by the Albion Women’s Beautifying Club, with Mrs. E. P. Carlyle as chairman of the fund‐raising and construction. It was designed by W. E. Felix, an architect from Fairfield. William T. Burrell was in charge of the actual construction of the structure. The main purpose of the Pagoda was for band concerts, a popular social event of the time; as well as a shelter for the Albion Mineral Well located beneath it. The two‐story structure is octagonal in shape, having eight brick columns. Access to the upper floor is by way of stairs going up from the southeast side and leading into the center of the band floor. The upper floor was used for the band. Rails around the stairs were for the band members’ safety. The roof is of red clay tile, somewhat resembling the roofs of pagodas in the Far East; with the overlapping tiles coming to a peak in the center of the roof. 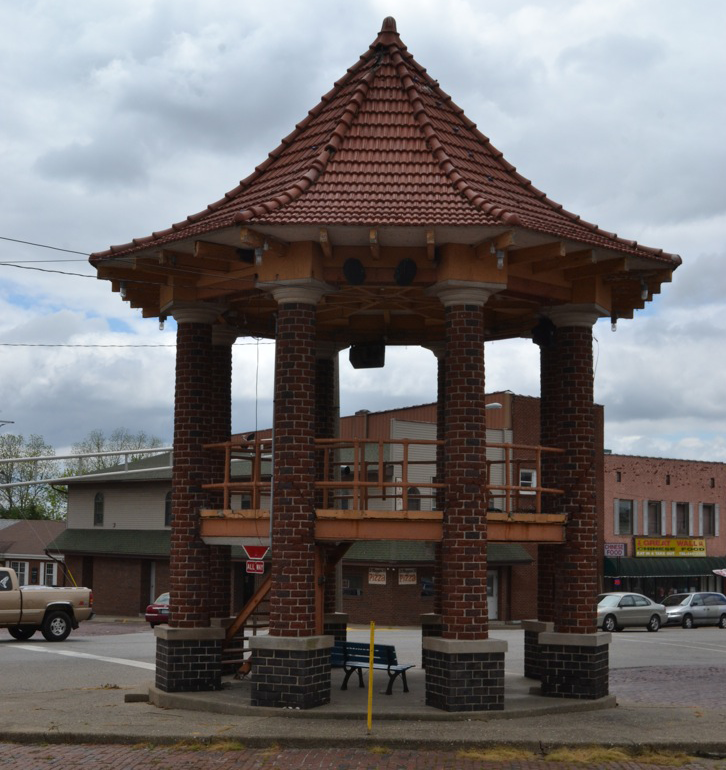 Dedication of the Pagoda was made August 29, 1914, as a tribute to William T. Burrell, Albion’s Bandmaster from 1884 to 1914. He did more locally for the advancement of music than any other one person. For his services of instructing some 200 young boys how to play musical instruments, he never charged a penny. The Pagoda is actually the third such structure to be built in this location. In 1889, a public well was dug on this site. The water in the well was cool, mild, and very agreeable to the taste of those accustomed to it. Many people who drank from the well began to experience relief from their body ills. Many people claimed to be cured of their rheumatism, kidney and urinary troubles, derangements of the stomach and bowels, and many other afflictions, by the use of the water. The cures were not confined to hometown people only. News of the Albion Mineral Wells was widespread. People from neighboring towns came to drink the Albion Mineral Water and great quantities were shipped upon people ordering it. In the evenings during warm weather, crowds frequented the well. There were actually four public wells dug, one on each corner of the Public Square. Two of those wells supplied water strongly impregnated with minerals. However the water from the well on the southwest corner was considered the best by most. That on the southeast corner was so strong that animals refused to drink it. 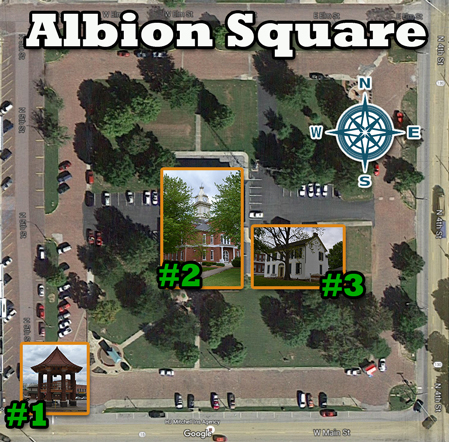 A neat structure was built about 1890 over the popular Albion Mineral Well. It was a simple wooden structure built in a square with a hipped, tin roof, eight supporting posts, and open sides. Arches were formed by lattice work on the open sides. The second structure on this site was built about 1906 and was built on the same order as the first structure, except that it was a two‐story structure with an outside stairwell located on the east side, which provided entrance to the upper story. Arches were formed by lattice work on the open sides of the upper story, with the lower half of the upper story being boxed in for safety. The upper story was used as a bandstand for the frequent concerts in warm weather. The town fire bell was located on top of the bandstand. This structure served the community until 1914 when the present structure was built. If you’re standing by the Pagoda, look west and slightly north to the center of the Square. That big brick building is the Courthouse!